A big win for poultry workers! Tyson commits to major steps to improve worker health and safety, compensation, worker engagement, and transparency—raising the bar for the rest of the poultry industry. Today the biggest player in the US poultry industry, Tyson Foods, announced new and expanded commitments for workers that are a win-win-win for everyone involved. Now, consumers can feel better about the working conditions under which their chicken is produced. Investors and the public will know more about what happens inside Tyson’s plants. And the company will benefit from establishing itself as a market leader on sustainability and transparency, particularly on workers’ rights. Most importantly, if Tyson follows through on its commitments, workers will enjoy higher wages and benefits, safer conditions, and more opportunities to engage in the workplace and speak out without fear of retaliation. This was no small feat. These are major milestones which have come through Oxfam and a broad coalition of organizations’ work to expose the harsh realities inside poultry plants in the US, applied public pressure on the industry to set new workplace standards. Oxfam is proud to have worked with many organizations to get to this point. But as our partners note, this is the beginning of a new phase, not the end of the effort. We will be working with them closely to make sure the workers in the plants see real change. We will also continue our efforts to put pressure on the other major poultry producers in the US. This week we will travel to Perdue and Pilgrim’s headquarters, turning up the heat as these companies fall further behind in the treatment of their workers. Increase workforce engagement, including expanding the scope of worker representation in plant safety councils and during plant audits. In addition, the company will soon begin making public the results of third-party audits which examine and address the needs of workers in the plants—a first for the industry. We will continue to call on Tyson to ensure an effective implementation process that includes worker representatives and health and safety experts. 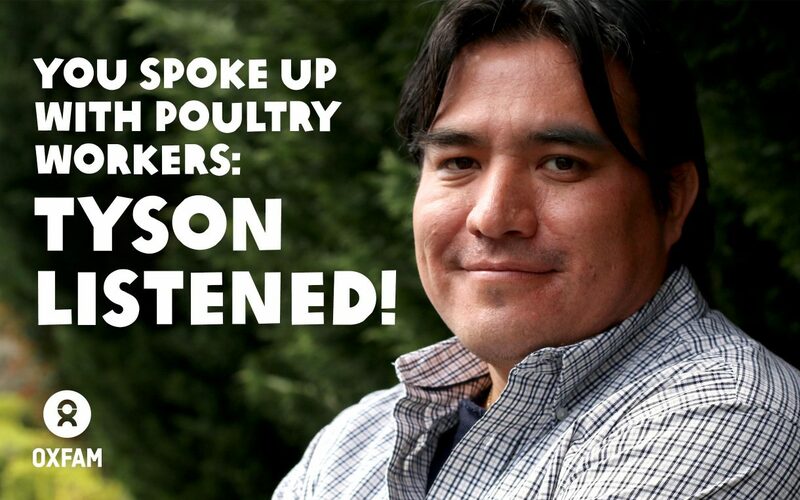 Since 2014, Oxfam has worked with a broad and robust coalition of organizations dedicated to poultry workers in the US. The groups include worker centers, unions, civil rights groups, nonprofit advocacy groups, and a variety of experts with long experience in government, academia, and the law. The coalition was central to the effort to prevent an increase in the maximum line speed in 2014. These organizations have been shining a very bright light on the reality of conditions inside poultry plants for several years. Among the organizations who have released scathing reports which have documented these conditions are: Oxfam, Southern Poverty Law Center, Northwest Arkansas Workers’ Justice Center, and Greater Minnesota Worker Center. Every day, we’re impressed by the courage of the workers who are willing to tell their stories, by the dedication of the organizers who spend day and night nurturing these relationships, and by the attorneys and physicians who represent them. For Oxfam’s part, our campaign worked on many levels to put pressure on the industry. More than 100,000 consumers signed a petition to the top four companies (Tyson Foods, Pilgrim’s, Perdue, and Sanderson Farms) which we delivered to Tyson’s headquarters in May. In addition, millions of people shared our report on the denial of bathroom break on social media, and cultivated media coverage around our reports to raise awareness and elevate the voices of workers and advocates. The companies took notice, and responded. Over the last two years, we’ve filed shareholder resolutions with three of the companies, and attended their annual meetings to educate investors and encourage them to engage the companies on working conditions and workers’ rights. As part of the coalition we’ve pushed government agencies for years to take more action on issues facing poultry workers. Since our first report launched in October 2015, the Government Accountability Office (GAO) released a report on conditions in the meat and poultry industry; and the Occupational Safety and Health Agency (OSHA) has announced new Regional Emphasis Programs, which are bringing increased oversight and enforcement of health and safety in the poultry industry by government regulators. This campaign has made clear the power consumers can have on company behavior. The importance of consumer pressure: Big Poultry is feeling the heat on a number of fronts. As we have seen with recent announcements by poultry companies to phase out the use of antibiotics and improve treatment of chickens, these companies listen to consumers, take their concerns to heart, and change their practices as a result. The consumer landscape has shifted: Consumers want to know more about where their food is coming from; and they CAN know more. Information is more readily available, and is shared more widely. Consumers now expect companies to be more transparent, and accountable, than ever. Consumers are concerned about many aspects of their food: For years, consumers have been pressuring companies about the widespread use of antibiotics, and they’ve expressed outrage about how animals are treated in industrialized conditions. Increasingly, consumers understand that labor is a critical element in the food system and recognize that many people work hard to bring food to their table. Once they notice the hands that feed them, though, they also must face the fact that these jobs are extremely difficult—they require arduous physical labor in extreme conditions (from heat to cold), pay low wages, and offer little opportunity to get ahead. Most food workers are from vulnerable, economically desperate populations. Increasing consumer interest in and expectations of the food industry can be powerful tools in the pursuit of social and economic justice, as it has been in the case of poultry. Continuing to make these company-consumer connections will be important on the road ahead. You can learn more about the new announcement from Tyson from the perspective of our partner Northwest Arkansas Workers’ Justice Center in this blog post. And please take action! As we welcome this announcement from Tyson, we also continue our efforts to pressure the other top poultry companies to step up. We’re rallying at Perdue today, and speaking out at the Pilgrim’s annual general meeting Friday. Share on Facebook and Twitter to pressure the other companies to keep pace with change! thank you for making a difference for the workers and the poultry. I stopped eating chicken 15 years ago because of my concerns. Many production workers in the US are being exploited, not to mention those outside the US. I also gave up eating chicken, pork and beef 20 years ago because of the factory atmosphere of growing and processing. I am aware of many people who are no longer eating meat due to the terrible conditions of animal treatment as well as the workers preparing the meat. Both workers and animal conditions MUST improve! Thank you to all who worked to bring about the changes that helped to make this a more humane world for all living things. I only eat humanely raised meat, and pay considerably more for it, but decided years ago to not support factory farms. Let’s extend this fight to elimination of factory farms in this country. They are literally concentration camps for animals. Improvements long overdue. Wages must rise for poultry companies’ workers. I will be watching and maybe even apply for a job in Tysons in Springdale, if these become reality. Stop subjecting workers to the massive animal cruelty in this industry and move to one the many meatless food sources. One awesome step for workers at Tyson, one forward and expanding step for all mankind. Way to go Tyson! Congratulations to Tyson for listening to your consumers to improve condition for your workers who handle our food. Congratulations to Tyson workers. I hope Tyson fulfills there promises. I for one will be avoided the other brands until they follow in Tysons footsteps. Will this stop the workers taking out their anger on the helpless animals? Will Tyson raise its standards in housing, feeding and caring for its poultry? If not, then the work isn’t done and I STILL won’t buy Tyson. We can’t advocate for improving conditions in food processing operations without improving the conditions for the human beings who work there. I want to buy food that represents justice, respect, and dignity for the people who produce it. We need to have humane treatment of humans in this industry. 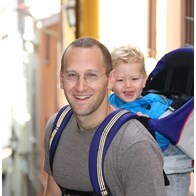 Robbie Silverman is a Senior Advisor in Oxfam America’s Private Sector Department.